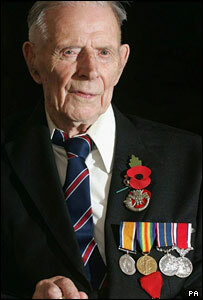 In Britain last week 'we' were been saying farewell to 111 year old Harry Patch. Although most of us had never heard of him a month ago Patch, and 113 year old Henry Allingham who also died recently, had fought in World War One. Patch had been the last British man alive to have seen active services in the trenches, and had been very critical of war. "It wasn't worth it" he said. He had kept quiet about his wartime experiences until quite recently, but felt compelled to speak out when he realised that he was one of the very few left with first hand experience and that the rest of us were in danger of forgetting just how stupid is all was. Politicians and military people seem to feel no irony in lauding Patch and repeating his sentiments as noble and reasonable. War, according to Harry Patch, is "organised murder"; and, I would add, not very well organised in most cases. Asked what Patch would have made of the conflict in Afghanistan, Chief of the General Staff, Sir Richard Dannatt, is reported to have said: "He would recognise there is an inevitability that when relations break down often fighting ensues." Would he? He was quite unequivocal in life, but Dannatt would have him be something of a pragmatist in death. Perhaps death brings a new perspective on organised murder? In Afghanistan and Iraq Western soldiers are engaged in daily battles - many of these 'soldiers' are only teenagers. They were sent there to kill and be killed by these same politicians, and at least in the case of the Iraq war we can be reasonably sure that they lied about the reasons for starting the war. The avowed purpose of invading Afghanistan was to break the regime of the Taliban which harboured terrorists, and to disband Al-Qaeda and capture it's leader, former US Ally, Osama bin Laden. It has done none of these. The result of both conflicts has been civil war, with western forces in the middle. The media here daily report on the individual deaths of British Soldiers, but tens of thousands of local people have died and they continue to bear the brunt. The objective is nowhere in sight, and is being subtly replaced by something more achievable. By the end of the process the government will say that they achieved their objectives because by then the objectives will have become whatever was achieved. They will be rather like bankers receiving bonuses when the banks they ran went bankrupt. Why are people in the Middle east - in Afghanistan, Iraq, Iran, etc - fighting back? Don't we offer the world prosperity and democracy and all the benefits these imply? Why are they so ungrateful? I don't have time to go over the whole history but I could summarise it by saying that the West has always sought only it's own prosperity in dealing with these nations and usually at their expense; we have frequently connived and plotted against the people - Western governments have propped up and armed(!) authoritarian regimes which were anti-democratic. * The flat truth is that Western governments, especially the governments of the UK and the US, cannot be trusted. Hell, even we the people no longer trust our own governments to be truthful and fair-dealing. The current wars are just typical behaviour for our nations. 'We' still think it's worth it. So we pay lip service to Patch and continue to start wars. There are several reasons I seldom write about politics and politicians. I think that paying attention to them only encourages them - they are like sociopaths who misbehave in order to get attention. Secondly, though I can navigate some subjects with confidence, I find politics baffling. It's usually better to say nothing under these circumstances. Thirdly I see this blog as a way for me to work through my thinking on Buddhism and the Dharma, and frankly I fail to see how the Dharma can help with politics. All of which tends to put me in a bad mood, but the hypocrisy of warmongering politicians seemed to need some kind of comment. In order for the Dharma to make a difference individuals must recognise the need for change, realise that the Dharma represents the best way forward, commit themselves to practice and persevere over quite a long period of time. One must resist the temptations of materialism and the crush of peer pressure and strike out on one's own. Conditions are generally against this kind of life, against this kind of inquiry. The political arena is particularly unsuitable for taking up the spiritual life because it is popularist, combative and materialistic. One might argue that spiritual leaders can make large scale changes. One does see charismatic spiritual leaders able to mould the thinking and behaviour of their followers, but this usually involves abdicating personal responsibility and self-awareness. What often happens is that immature people follow blindly, and then at a later stage have a violent reaction against the authority figure and blaming them for their own weakness of will. How well we know this scenario in Western Buddhism! As Buddhists we are in a dilemma - we benefit from a stable society with freedom of religion (just as in the Buddha's time! ), and yet in order to participate in the political process which ensures those freedoms we inevitably compromise our values. I don't know how to resolve this. Let us not forget nor dishonour our dead, nor forget why they were killed. I do feel compassion for those who gave their lives, and those whose lives were taken against their will. This feeling has grown since I came to live in the UK where war is real in a way that it never seems to be in New Zealand. Let us also remember the history of conflicts and what lead our countries into conflict. These are days when we know the price of education but not the value of it, and this makes us very short sighted. History would seem to be more vital than any subject at present. Let our schools teach the history of Western involvement in Afghanistan, Iraq and Iran (and and the rest of the world) openly and honestly so that we may learn the lessons of history - that arrogance, double dealing and greed will breed hatred and mistrust; that as we have sown, so we are reaping. Perhaps we should not be so quick to resist the popular notion of karma - what goes around, comes around - in the case of politicians? They seem to believe that the consequences of one's actions can be avoided by skilful manoeuvring - they don't personally go to war. Hopefully I won't feel compelled to write about politics for a long time to come. * A useful summary of Western involvement in Iraq/Afghanistan/Iran can be found in Wheen, Francis. How Mumbo Jumbo Conquered the World : A Short History of Modern Delusions. Harper 2004. Especially chapter 7 'Us and Them'. image: Harry Patch from Sailing to Byzantium. Why do we have a sense of self?